As seen on the hit TV show 'Tree-House Masters' on Animal Planet. No Imports, No Resin (plastic), No Faux Stone mass-produced low-quality Gnomes are sold here! Garden Gnomes are delightful Symbols of Hope, Luck, and Goodwill. Beautiful High-Fired Stoneware Pottery that will last generations, for your grandchildren to enjoy in their gardens. Go ahead, start a Gnome garden today and help keep a tradition alive for tomorrow! Kimmel Gnomes Has Been Online And In The Same Business Location Since 2001. Gnomes Make The Most Wonderful And Unexpected Gifts! Gnome is fired in beautiful Stoneware Pottery, then are finished by hand. They are handmade and cast from rare 19th Century antique Gnomes, and from original sculptures by Kimmel Gnomes. 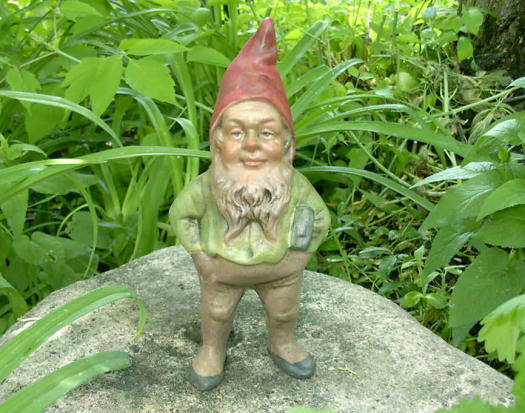 We're always adding NEW Garden Gnomes into the Kimmel Gnomes website, so please check back often. To be put on our New Gnome Notification List so we can alert you when new garden gnomes are available, please send us an email.